The Far West Local Health District Aqua Class volunteers and participants were thrilled to receive new weights to use in their Monday and Wednesday aqua classes, courtesy of Carrie Oakley. 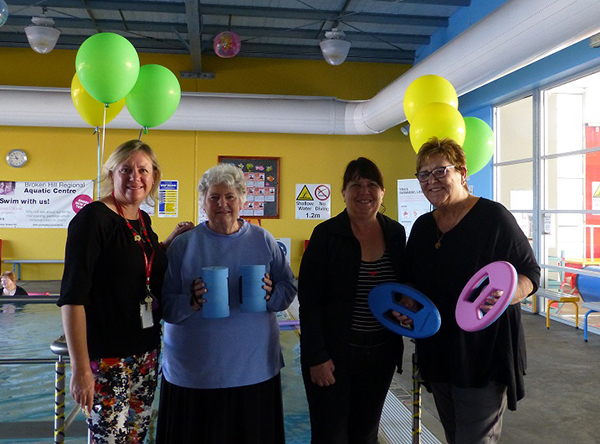 The Aqua Volunteers, Ann Millsteed, Eleanor Blows and Shirley Barnett said they were grateful for the donation of the weights which will be easier for the participants to use. Ann said that the new round weights will be especially helpful for participants who are unable to grip the conventional pool weights. Carrie Oakley said: “It’s a pleasure to donate the weights, I often attend the classes and have seen firsthand the difficulty a few participants have in gripping the old barbell weights that were in use. I think the Aqua Volunteers do an excellent job and their work enables the classes to be run free of charge for the Broken Hill community so I was happy make the donation”. Far West LHD Volunteer Manager, Mary Leehane, said: “It’s always great to get the community involved with our organisation, as volunteers, contributors or donors willing to contribute to volunteer services. The Aqua volunteers do an outstanding job; even on cold winter mornings they are at the pool at 7.30am ready to take participants through their routine knowing that the gentle water exercises are a beneficial form of exercise which the participants enjoy and at the same time it assists them to stay active”. Noni Inglis, Far West LHD Acting Human Resources Manager, was on hand to meet the volunteers and to thank Carrie for her donation. She promised next time she will join the class to meet the participants and test out the new weights herself. Classes are held at the Broken Hill Regional Aquatic Centre every Monday and Wednesday morning at 7.30am. Pictured with some of the donated items were (from left) Noni Inglis, Shirley Barnett, Ann Millsteed and Carrie Oakley.